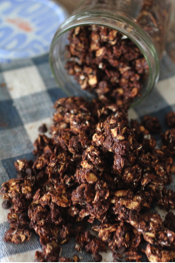 If you enjoy chocolate, you will love this granola! This granola recipe has the perfect balance of healthy fats, whole grains, and protein, which means it keeps you satisfied! This granola is wonderful on top of Greek yogurt, in some milk, or just as it is for a healthy breakfast, snack, or dessert! Preheat the oven to 350 degrees. Line a large sheet pan with parchment paper or foil sprayed with cooking spray. Set aside. In a large bowl, mix all of the dry ingredients together, followed by the wet ingredients, (everything except chocolate chips), and stir until the oats are moist, and clumps begin to form. Pour granola onto prepared baking pan and spread out evenly. Bake granola for 15 minutes, and then remove from the oven and stir. Add chocolate chips and return to the oven for an additional 15 minutes. Stir again and let sit until it is completely cool. It will begin to harden as it cools. Store in an airtight container for up to 2 weeks.